There is an ongoing and undeniable national housing shortage. Year-over-year inventory levels have been down in most markets for several years now, and that trend is expected to persist in 2018. Consumers are still purchasing for the first time and relocating to other, presumably more ideal homes. Having the financial ability to make a move clearly seems feasible to many eager buyers amidst a healthy economy, whether life events such as marriage, children, employment change or desirable downsizing is the reason for moving. There are further positive signs on the horizon, as builder confidence has improved and construction job gains are measurably higher. It will still take more effort than a lone year can provide for building activity to reach a needed level for inventory balance, but a step in the right direction is welcome. More sellers should feel ready and willing to list in 2018. Economic indicators such as unemployment rates and consumer confidence are in an improved state, and sellers currently hold the keys in the buyer-seller relationship. This does not mean that sellers can set their price and watch the offers roll in. On the contrary, buyers will be poised to test prevailing price points, particularly in markets where home price increases are outpacing wage growth and in light of the fact that mortgage rates are expected to increase further in 2018. Sales: Pending sales increased 3.2 percent, landing at 5,164 to close out the year. 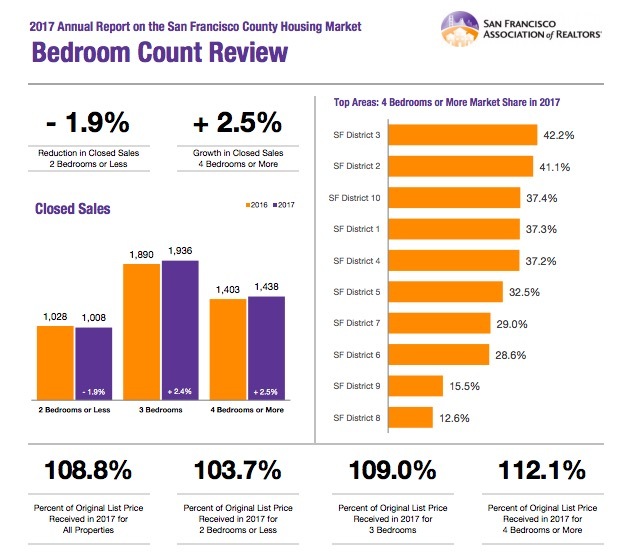 Sold listings were up 2.6 percent to finish 2017 at 5,150. 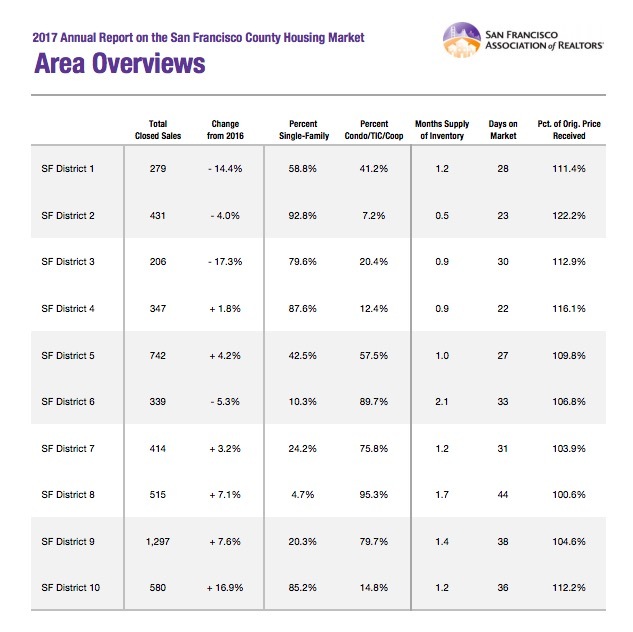 Listings: Year-over-year, the number of homes for sale was lower by 19.9 percent. 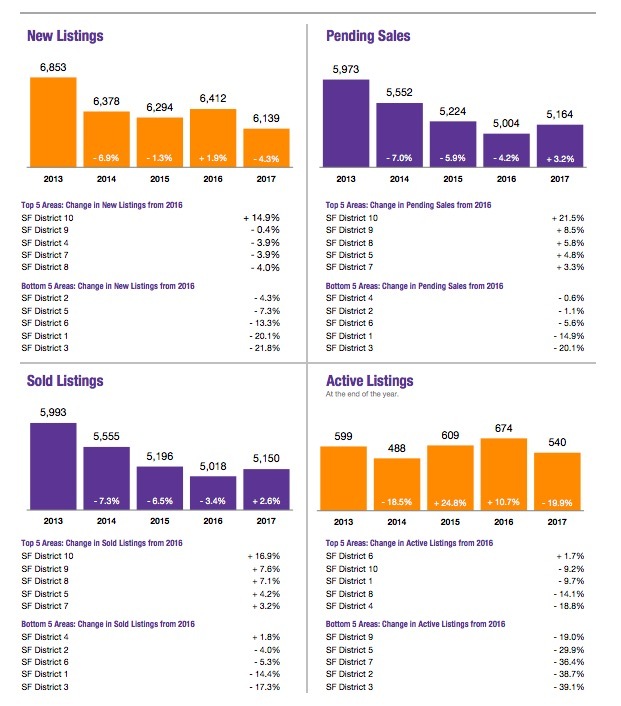 There were 540 active listings at the end of 2017. 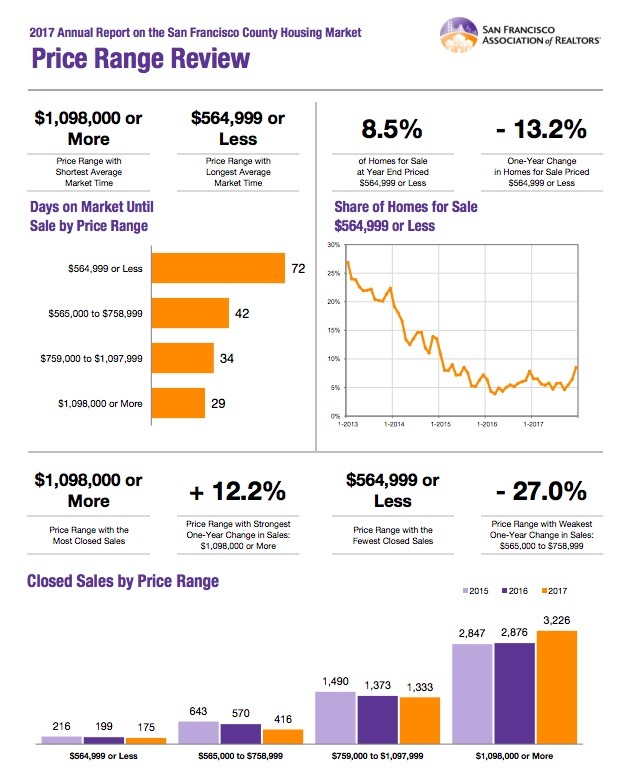 New listings decreased by 4.3 percent to finish the year at 6,139. Home supply was once again lower than desired in 2017. Prices: Home prices were up compared to last year. 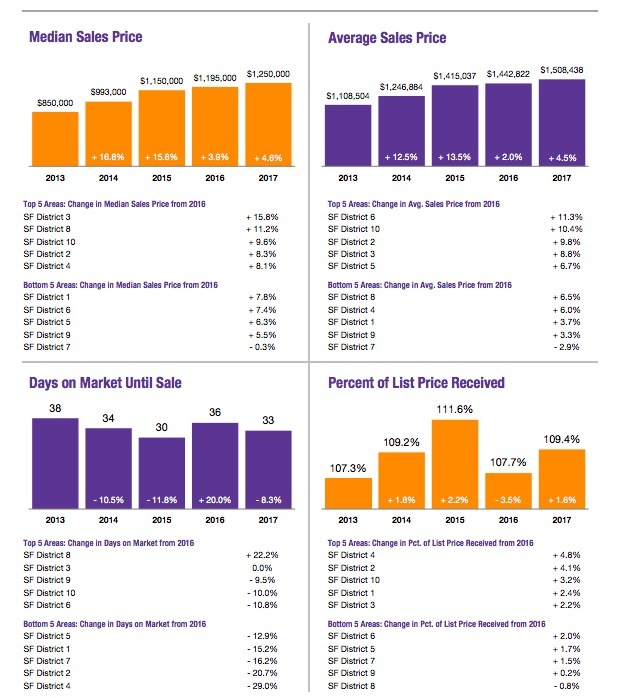 The overall median sales price increased 4.6 percent to $1,250,000 for the year. 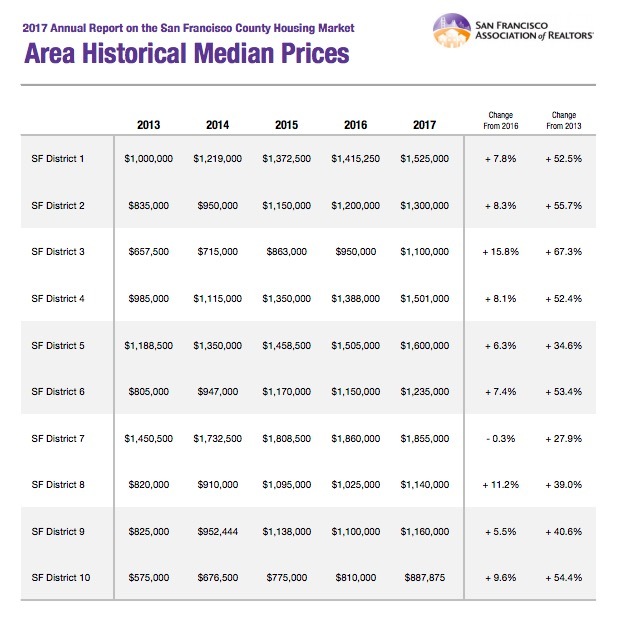 Prices are expected to continue to rise at a slow rate in 2018. Single-Family home prices were up 7.0 percent compared to last year, and Condo/TIC/Coop home prices were up 6.0 percent. 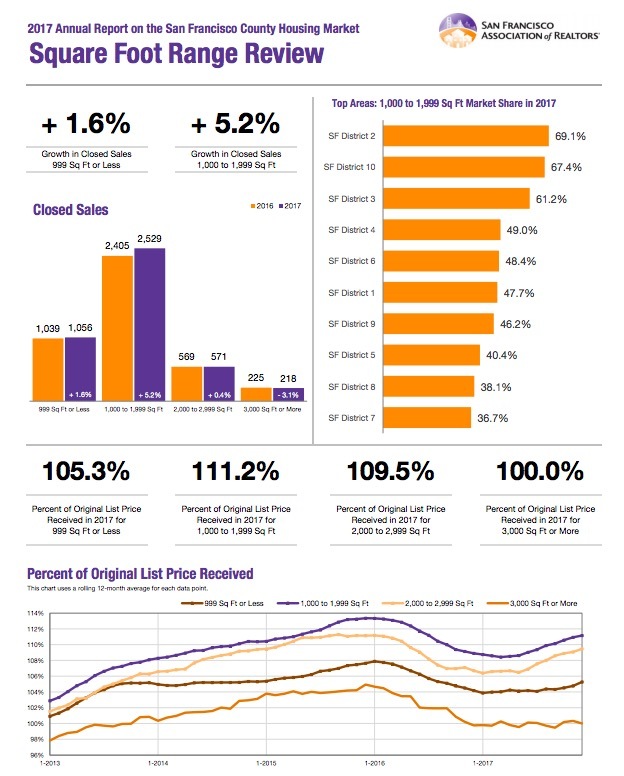 List Price Received: Sellers received, on average, 109.4 percent of their original list price at sale, a year-over-year increase of 1.6 percent. As sales prices are expected to increase further in 2018, this could bring original list price received at sale up as well. The historic tax reforms due to make their mark in 2018 will have varying effects across the nation. High-priced coastal markets may feel the changes stronger than the middle of the country. And some potential buyers may see the changes as providing less of an investment benefit for homeowners. Some observers warn that there might be enough lack of incentives to stifle homeownership, which is already near 50-year lows. Policymakers claim that the reforms will help boost economic activity and profitability. Whichever direction we ultimately turn, the next year appears to offer a dalliance with balance intended to intrigue both sides of the transaction toward a common middle ground. For those who have their minds made up to buy a home in 2018, it will likely be a competitive ride. 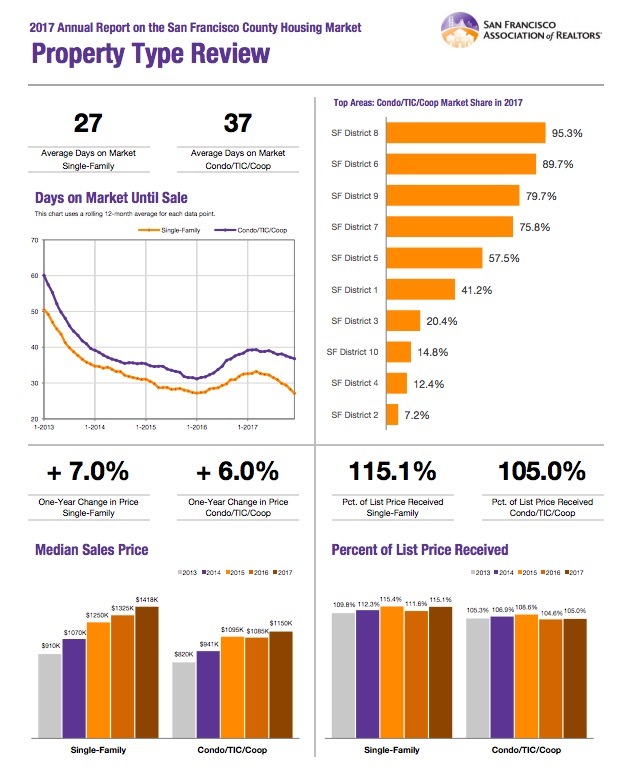 The trend has widely been toward fewer days on market and fewer months of supply, indicating strong demand despite higher prices and low inventory. This could prove tricky for first-time home buyers, especially for those who are impacted by student loan debt, content to rent or among the more than 15 percent of adult children still living at home. In a landscape rife with new variables, residential real estate is certainly poised to offer an interesting and active year ahead.